Gearing up our children for excellence! Family units, social infrastructure [such as our places of worship, schools, mass media and social networks] is set up to develop our children to be great assets to our world. These institutions help our children gain the right attitudes, beliefs, behaviours, values, knowledge and skills. We are who we are because of the sacrifices made by so many who have touched our lives and I am ever-grateful to them. When I first attended the personal transformation ‘playshop’ Mastery of Self [MS] through Neuro Linguistic Programming [NLP] I was amazed at the tools that are available to unleash our god-given potential in a balanced systematic and purposeful manner. While I got so much out of it to make my life a success from that programme, I felt I should have attended this programme when I was leaving school or even during school. Committing my life to helping those who I am fortunate enough to meet to lead a better life and to become a big contributor to making this world a better place, I joined my mastery teacher Omar Khan and his organization Sensei International and geared my-self to be successful by helping others to become successful. Needing to take this wonderful technology to children, we designed and launched a 2 day playshop ‘winning Edge for Children over a decade ago. It was first conducted by Sensei Pakistan’s Sualeha Bhatti and later by other Sensei consultants Tanzi Samsudeen, Melanie De Jong and Ajantha Dharmasiri. I sent my eldest daughter Natasha to attend it. Later on my second daughter Menasha also attended Winning edge. I believe this is one of the best benefits of my association with Omar and Sensei. Neuro Linguistic Programming (NLP), simply put is the process of continued communication that takes place, essentially by way of thoughts or words that have a direct relation towards behavioral patterns. NLP techniques are used globally as an effective tool for developing behavioral flexibility and competence in both adults and children. In particular participants benefit by learning to manage emotions, confidence and self-esteem. They will learn how to accelerate learning and memory, acquire excellent communication skills and overcome challenges one may face. My eldest daughter Natasha is now 23 years of age and is currently a Final Year student reading for her Masters in International Politics and Human Rights at City University London. My Second daughter Menasha is a second year student of fashion design following undergraduate studies at Northumbria University, Newcastle at Acadamy of Design and both of them are following their dreams and excelling in what they do. Here is an account from Natasha on how ‘Winning Edge’ impacted her. 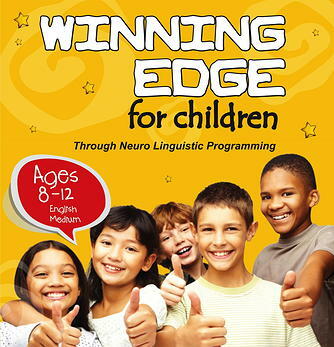 “I started my NLP journey when I took part in ‘Winning Edge’ for Children when I was around 10 years old. I truly believe that the tools that I learnt through these programs have helped me reach the place I am today. From excelling in school with tools such as mind mapping and memory techniques to having a clear cut purpose, and goals that will help me reach my purpose has really helped me stay focused and bring me to the point in life I am today. I feel blessed that I am gifted with the knowledge, passion and a team who can take this gift to children and adults in this part of the world and my dream is to take this gift far and wide around the globe. Courage: What will it take for us to display more of it?